MINI Cooper Acccessories + MINI Cooper Parts :: OutMotoring.com MINI Blog :: Car Care Products :: Keep the backseat a safe and clean environment for your pet. Keep the backseat a safe and clean environment for your pet. Synopsis: Taking the dogs with you? Be sure to have one of these in place! If you've got a pet you like to travel with or occasionally take to the park or on day trips you'll likely want to have a safe and clean place for your pet to hangout. The backseat is really the only reasonable place for a pet in a MINI and space is tight. 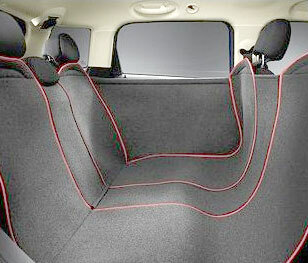 We now offer a MINI Cooper specific removable and cleanable pet liner that will offer the protection you need. While there are slight variations in the design of each style depending on the application (Clubman, Countryman, Hatchback, etc) they all do the same thing which is offer a great looking and easy to use protection for your seats while keeping your pet safe. The style for the Countryman and Paceman in continuous and connects all the way from the back seat to the back of the front seats while the other designs have separate panels for the backs of the front seats. Comments on Keep the backseat a safe and clean environment for your pet.